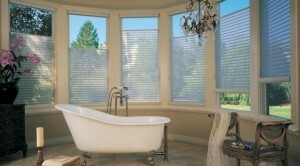 You may have heard the term “top-down/bottom-up” if you’ve shopped for new window treatments recently. This is a straightforward and versatile feature you may want to consider for at least some of the windows in your home. “Top-down/bottom-up” (or, bottom-up/top-down as it’s called by at least one manufacturer) means that the shade can be raised to the top of the window like a regular shade, but it also has the added ability to open from the top of the window down to the bottom. This allows you to have privacy at the bottom of the window while leaving the window open at the top for additional light and view to the outside. While this option does add additional cost to the shade, it can be a great option for bedroom windows, family or living room windows, or bathroom windows, where privacy can be a concern. It may not be a necessary upgrade in places like your kitchen or laundry room, where complete privacy may not ever be required. When considering a top-down/bottom-up upgrade, think about where the street is in relation to your windows, the location of your neighbor’s home, the lake or any other features of your home and lot that may affect your privacy needs at the windows. 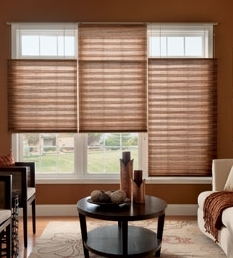 You will find the top-down/bottom-up operating feature offered in many types of shades including cellular/honeycomb shades, pleated shades, Roman shades, woven wood/grass shades, and sheer window shadings, offering an option for every style and home. One caveat to be aware of: you will see visible operating strings in front of your window when you lower the shade from the top. This is true with nearly every top-down/bottom-up shade, with the exception of Hunter Douglas Silhouettes (which has strings visible at the far edges of the shade only). The strings are narrow and nearly imperceptible in every photo shown here, but it is something to be aware of so you are not surprised on installation day. Next time you shop for window treatments, be sure you know about all the possible upgrades including the top-down/bottom-up feature. Now that you understand how it works and where it can be best utilized, you can make an informed decision before you buy. One Response to What is Top-Down/Bottom-Up?